7. 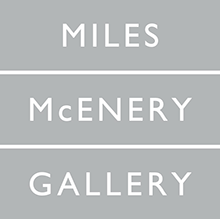 Stephen Dean at Ameringer | McEnery | Yohe, through February 6. Labor intensive doesn't begin to describe the technique New York-based artist Stephen Dean uses to create the large-scale “Crossword" watercolor compositions featured in this exhibition of recent works. Each square of the hundreds of crossword puzzles from newspapers and magazines, mounted on archival Tycore, is tinted with a drop of watercolor, estimated at 100,000 drops per panel. The process of creating these works must be as rigorous and contemplative as the resulting images, which are at once visually arresting and psychically soothing. The fluid color counters the rigid geometric patterns of the crossword sections in each work, instigating a luminous, pulsating surface. 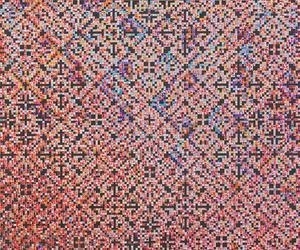 The overall feeling must certainly correspond to that of finishing a particularly complex puzzle., through February 6. A rear gallery features “You are Here," a series of three-dimensional paper works, featuring overlapping grids meticulously drawn in red ink on translucent sheets of Chinese calligraphy paper or rice paper. Intersections of the drawn lines are pinpointed by colorful glass-head needles that protrude an inch or so from the surfaces. The structural integrity and meditative comportment of these unusual hybrid sculpture-drawings, is a forceful addition to Dean's by-now formidable oeuvre, which consistently centers on the phenomenological properties and sociological implications of light and color.